Metering of the seed is done at the tanks. 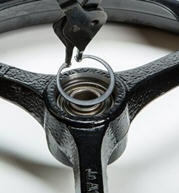 While metering in volume, the co-efficient of variation from opener to opener is just 2 percent at the feed wheel. The population rates are controlled by meter speed as opposed to varying the amount of meter flute exposure as on a box drill. By using this method, population rates can be better controlled, resulting in lower amounts of population variance from meter to meter. That is better than any other volumetric metering system on the market today. The 1990 Central Commodity System (CCS™) also features metering gates at each individual metering wheel. This allows the operator to set the seed gate based on the seed size and population rate, to allow for even greater control of the population rates. 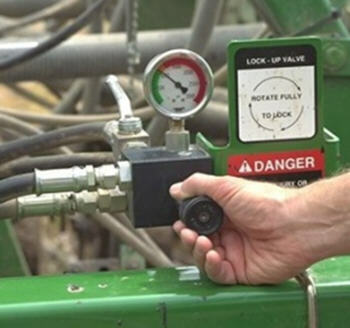 The meter gate can also be used to shut off seed flow to an individual seed meter if desired. The narrow black roller is recommended for low application rate crops such as sorghum. 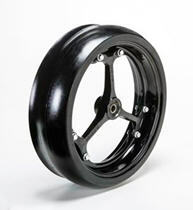 The medium-rate black roller is used for application rates of up to 89.7 kg/ha (80 lb/acre). The white high-rate roller is used for larger seeds and for high application rates. 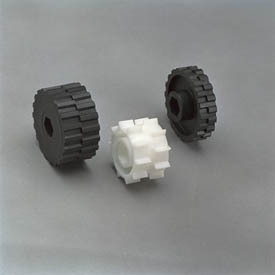 The white high-rate roller is also used for crops such as barley, oats and rice on 1990 CCS dual-rank models. The metering rolls are interchangeable as well. Available metering bundles allow the operator to change over the complete meter assembly when changing crops from a high-rate crop to a lower population rate crop. The 1990 CCS features an oscillating seed agitation system. 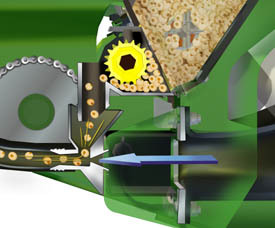 The oscillating-style agitation system is more aggressive than a rotating style to be able to handle crops prone to bridging such as barley and rice. They can be easily removed or interchanged when changing over from seeding one crop to another. Meter rolls are available from 18 port to 34 ports or nine rolls to 17 rolls per meter section. 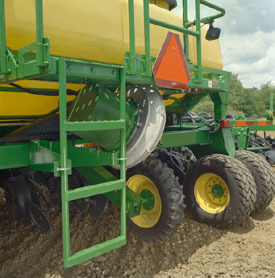 Meter rollers are compatible with a wide variety of crops and rates. IMPORTANT: 1990 CCS single-rank machines are compatible with soybeans, wheat, and milo. 1990 CCS dual-rank machines are compatible with soybeans, wheat, milo, barley, oats, and rice. Seed populations can be changed on the go with electronic population rate control (EPRC). A simple adjustment (switch A) in the cab allows either increasing or decreasing the seeding rates to match the target population. 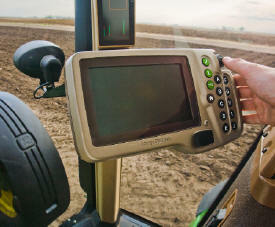 The EPRC allows operators to keep tight controls on population rates by allowing in-cab adjustments of population rates. The available seed-counting system allows viewing actual soybean population rates on the go. 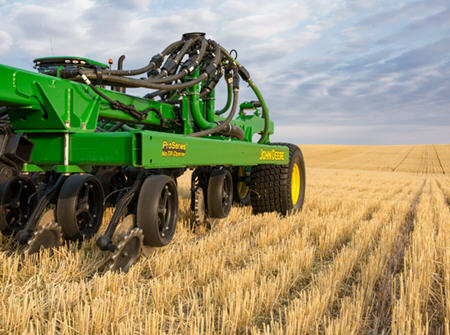 Half-width disconnect (switch B) is in base equipment to allow seeding point rows or headlands without overlapping, saving seed and input costs. The half-width disconnects can also be activated and deactivated from within the SeedStar 2 main run page. The green boxes at the top of the screen with 1 and 2 in them indicate that both half widths of the drill are seeding. 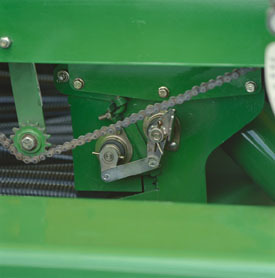 The electrically operated half-width disconnect clutch allows the operator to shut off half of the drive system conveniently from the tractor cab. NOTE: Tanks are not pressurized. Airflow is generated by a 44.7-cm (17.6-in.) diameter, hydraulically powered fan. Air is then channeled to the plenums, which distribute the air evenly among all of the air runs. After the air has left the plenum, it enters the venturi area. It is important to have the ability to monitor seed flow out of each individual opener. 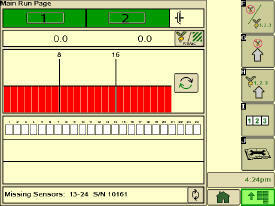 The SeedStar™ 2 blockage system allows the operator to monitor product flow to each individual opener. 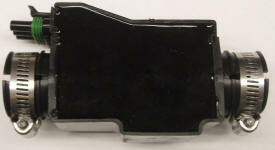 A product flow sensor is mounted on each 1-in. seed hose located after the flow splitter. 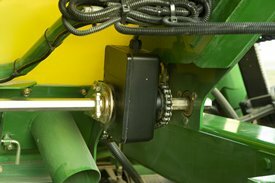 The optical flow sensor uses infrared technology for seed flow detection to ensure that the sensor does not impede product flow through the seed hose. 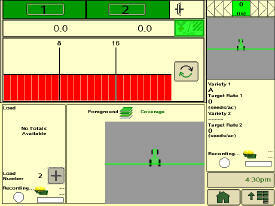 The SeedStar 2 display gives the operator an in-cab warning as to the exact row that has been blocked. The console will provide an audible alarm and display the exact row number to the operator that has become plugged. The SeedStar 2 display also has the ability to monitor seed population rates at the meters, reducing the number of in-cab consoles that are required by the producer. SeedStar 2 works on both single- and dual-rank models. On dual-rank machines the sensor is located after the wye splitter. Single-rank machines have a sensor installed on each individual row. 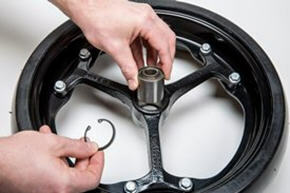 Complete meter assemblies are used when needing to switch meter wheels to seed a combination of crops such as soybeans and sorghum. 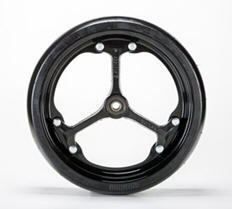 Two banks of white meters are used for soybeans and two banks of black or narrow black wheels are used for sorghum. Producers can either convert the set of meter banks that came on the drill by ordering extra meter wheels and assorted parts or they can order an extra set of banks and swap them when switching crops. The benefits of ordering whole meter assemblies include reducing the time necessary for switching crops, added convenience, with less hassle, and fewer chances for assembly errors. NOTE: The following bundles are compatible with the 1690 CCS/1890 CCS models. The 1990 CCS drives the meter from the right-hand side, while the 1690 CCS/1890 CCS meters are driven from the left-hand side. By removing the sprocket and reversing the meter shaft, these meter bundles can be used with 1690 CCS/1890 CCS models. The 1990 Central Commodity System (CCSTM) allows producers to enjoy greater flexibility with their machines due to the increased crop compatibility that the unit offers. With the oscillating agitation system, the 1990 CCS can now work with crops such as barley, oats, and rice. For those crops that are prone to bridging, additional items are available to promote positive seed flow. The available meter dividers are installed next to the feed gates and the edge on the metering system. These dividers help minimize the chance of product bridging above the meter gates. When the unit is being used to plant crops, such as soybeans and wheat, that are not prone to bridging, the dividers are easily removed. NOTE: Meter dividers are required when seeding oats with the 1990 CCS.